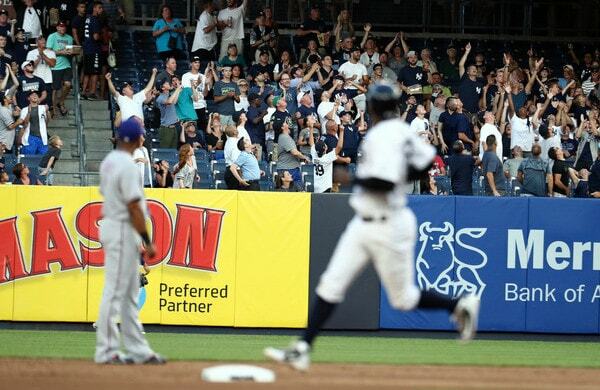 Make it four consecutive wins for the New York Baseball Yankees. First four-game winning streak since mid-June. The Yankees mashed some damn taters in Thursday night’s series opening 7-3 win over the Rangers. They are a season-high tying one short of their season high at 30 games over .500 at 72-42. Sinkerballer? No problem. The Yankees can hit home runs against anyone. They tagged rookie righty Ariel Jurado for four home runs in five innings. He went into the game with a 50.0% ground ball rate and did record 13 outs on the ground compared to zero (!) in the air Thursday, but the Yankees hit five balls out of the infield against him, and four left the park. Brett Gardner’s first inning flare single to left was the only non-homer. Giancarlo’s home runs just look different. The ball explodes off his bat unlike anyone else I’ve ever seen. That home run left his bat at 121.7 mph. It’s the hardest home run recorded since Statcast debuted on Opening Day 2015. Goodness. Stanton’s home run gave the Yankees a 6-3 lead. Walker added another solo home run in the sixth for a 7-3 lead. First time in his career he went deep from both sides of the plate. In his last 22 games Walker is now hitting .328/.380/.557, which is awesome. He’s getting regular at-bats and he’s settled into a nice groove, and the Yankees have needed him to help pick up the slack while Aaron Judge and Gary Sanchez are out. Well done, Neil. The five home runs give the Yankees 186 for the season and puts them on pace for 264. The single-season record in 264 homers by the 1997 Mariners. Gonna be a close race. A quality, workmanlike start for J.A. 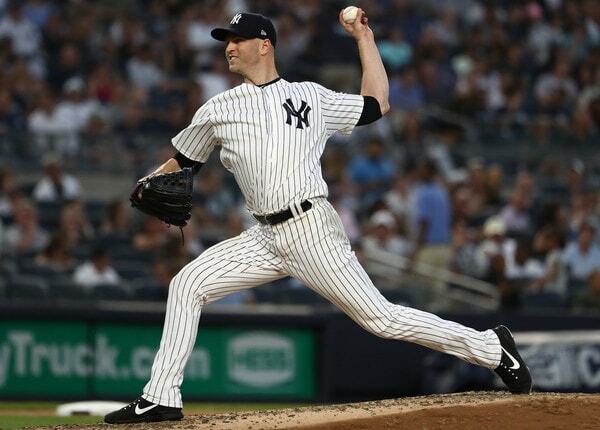 Happ in his first outing back from the disabled list. Three runs in six innings, so it was a bare minimum quality, though in only one inning did he face a real jam. That was the fifth, when Shin-Soo Choo got a revenge double — Happ plunked him in his first two-at-bats — to drive in two runs. Happ went from 0-2 to a walk against Robinson Chirinos to start that inning, which is annoying. A bloop, a sac bunt down four runs (? ), and the double followed. Sixty-five fastballs among 94 pitches is 69.1% heaters, which is a touch below his 74.4% season average. Nothing crazy though. Happ threw 20 sliders Thursday night, his second highest total of the season, and that’s because the Rangers had four left-handed batters in the lineup. He was sweeping that slider away from the lefty batters all night. The final line: 6 IP, 4 H, 3 R, 3 ER, 1 BB, 9 K, 1 HR, 2 HBP on 94 pitches. Good start for Happ. The Yankees wanted an ace at the trade deadline, and when an ace wasn’t available, they went for the next best thing: Competence. They just needed someone who can go out and do what Happ did Thursday, and that’s keep them in the game for six innings. The offense and bullpen will take care of the rest. Messy ninth inning for Aroldis Chapman, who walked the first two batters he faced before settling down and retiring the next three. His fastball averaged 96.7 mph — he did run it as high as 99.9 mph — which is his slowest average fastball in a game since June 2012. Both Chapman and Aaron Boone say he’s fine physically. He went through a funk like this last August, then bounced back in September. Hopefully this is just a bump in the road. Two hits for Gardner, who did not go deep. He had two singles instead. Andujar (single, homer) and Walker (two homers) had multiple hits as well. The only Yankees without a base hit were Greg Bird, Austin Romine, and Shane Robinson. Bird is now 4-for-39 (.103) in his last eleven games and two of the four hits are bunt singles against the shift. Please start being good, Greg. Game two of this four-game series. The Yankees and Rangers will be back it at it Friday night at Yankee Stadium. Masahiro Tanaka and Mike Minor are the scheduled starting pitchers for that game.